I have never been involved in FAI C/L racing, but I imagine things have changed fairly significantly since this article appeared in the January/February edition of American Modeler. It is the second in a two-part installment, and unfortunately I do not have the December 1962 edition yet. You have your FAI Team Racer built, so flying it comes next. The level of skill required to make a good competitor means that you or your pilot must start out with some experience, primarily racing type. International event pilots must know the importance of "down elevator". Main cause of torque rolls and slack lines is a full-up take-off. This type of maneuver is stupid, and especially wrong in FAI. Why down elevator and how much? Any racing plane has rapid acceleration. This acceleration generates a lot of lift. If the plane makes a normal uncontrolled leap-off, there is nothing except tip weight to prevent a roll. You know what limited effect tip weight has. Down elevator prevents this sudden build-up of lift from marring your take off. Just a little down will enable the plane to fly off the ground in a stable climb. The usual American-style Rat Racing VTO is out anyway. The minimum height of 6 feet and the maximum of 9 feet, with up to 19 feet in which to pass, mean that in addition to a stable plane, a careful man is necessary. This straight and level 3' grooved flight must be practiced continually, in all types of weather, preferably with someone else flying in the same circle. Good FAI pilots can fly within inches of each other with no sweat. The rules require the pilot to fly with the control handle against the centerline of his chest. This is an awkward position, but it means the pilot is assisting his plane as little as possible. It also makes the pilot to keep up with his plane. Seldom do you overtake in usual Rat Racing fashion by first passing the flyer, then his plane, because he is lagging behind. Passing requires care. The preferred way is to pass as close as possible to the job you are overtaking to eliminate seconds (distance) lost in a long climb. This is the only time you can take your hand from your chest. Passing is such a delicate. maneuver you must practice it with someone else. A Team Racer is not essential to provide the fundamentals of low altitude, high speed flight. Rat Racers are capable of the same quality flying if designed and built properly. It is certainly less expensive to replace a Rat Racer should you goof. Fuel (as mentioned in our previous article) is a controlling factor in performance. There are no exotic fuels, but there are good and bad fuels. I feel that commercially, Cub Diesel is the one to use. Addition of about 5% ether will help it. The fuel ingredients if you mix your own are almost standard. The Oliver Tiger formula is used universally. This is 20% oil, 30% Ether, 50% Kerosene, 3% Amyl Nitrate (yes, it adds up to 103%). The oil obviously is for lubrication. Bakers AA Castor Oil is the best you can use. Synthetic oils such as UCON LB1145 should be merely as additives - no more than 10%. Used straight, they cause hot running. Kerosene is the power ingredient. There is every advantage to buying the best grade available. I use the chemical quality, since it gives me more consistent performance than the. gas station type. Depending upon your average climatic conditions, you might not be able to use a full 50%, but will have to increase the ether content to cool off the fuel. The ether, anesthetic grade, or ethyl ether, is to ignite the kerosene. Although the engine will run on less than 30%, the higher compression then required over-strains the piston, rod, and crankshaft. Ether is also used to cool the fuel, by lowering the ignition point. More than 40% however, will rob too much power. Determine the proper balance of ether and kerosene by trial and error. Amyl nitrate, and its replacement, propyl nitrate, smooth out the high rpm ignition. Don't skimp here. Too little will cause immediate overheating problems. Should you mix your own, there are three handy tools. A 500-ml graduated cylinder to mix large quantities and percentages, a 50-ml graduated cylinder for small quantities and small percentages, and a large funnel to help pouring. Propellers determine speed and can help or hinder lappage. Obtaining the proper size is a matter of test with the aid of a stopwatch and lap counter. Trim prop diameter and area distribution until performance is where it cannot be improved with a recorded prop-fuel combination. If this is not high enough, try different combinations until you attain competitive times. No one else is going to do it for you. Your pilot must learn a new technique to derive full benefit from the mono-wheel gear. 99% of the European Racers use this. It is most important to have the wheel as far to the inside of the circle as possible, to provide maximum pull-out during takeoff and landing. This automatic pull-out explains its popularity. A wheel which cannot come off the strut and a tire which stays on the hub are vital. The length of the strut is not as important as the torsion type mounting. This mounting will allow a plane to land roughly without serious damage or bouncing. The take-off and landing procedures should be practiced at every opportunity, it is here that the most errors are made by pilot. Suppose we run through a race? First, the circle layout deserves attention, since the conduct of the race is determined by its various features. This idea is to provide at least 60 feet of clear area in which to take-off and land. This is to eliminate as much as possible conflicts or accidents during this critical phase. It is accomplished by dividing the outer circumference into six equal segments. Re-fuelling and restarting can only be done in one of these segments. So pilot and pitman must coordinate their efforts to get their plane serviced at the same segment each time it lands. The distance between the mechanics' outer circle and the pilots' inner circle is equal to the length of the control lines. The pilot cannot leave his circle, the mechanic cannot enter the outer circle. The space between is a no-man's land - there no one is permitted. This is to prevent planes from hitting people. If your plane stops inside no-man's land beyond reach ... that's all, Brother. Since line length equals the distance between the two circles .the pilot can clobber a pitman if he brings his plane across the outer line too soon. It is also possible to taxi into lines held off the ground. This hazard is the pitman's responsibility. The FAI is very strict on any interference with a competitor so caution is needed as well as skill and determination. Control lines are 626 inches from the handle center to the plane center. The .012 inch diameter may seem oversize, but the FAI desire for safety is again in evidence. Heavier lines do not curtail performance much. Stranded lines are safer, since in humid or wet weather they slide, solid lines may not. The race is run over 100 laps, against a clock. The altitude limits mean the distance flown is that intended by the rules. Each team is permitted at least one official attempt, with a maximum of two. The three entries with lowest heat times fly together in a 100 lap final. The start differs from any in AMA country. Each team picks its own take-off position prior to entering the circle. Then comes a thirty second warm-up period where the engines run to finalize adjustment. At the end of thirty seconds all motors are stopped, the tanks topped off, and each mechanic stands away from his plane. Pilots kneel with their hands and, handles on the ground. The period immediately after warm-up time is also thirty seconds in duration. The last five seconds are usually counted down. At zero, the mechanics start motors and launch the models. The clocks start and lap counters are readied at the zero count. Once airborne a pilot must not interfere with another pilot or model. If he is passed, he must not hinder the faster plane; and when doing the passing, he warns the pilot he is overtaking. Keeping the model within that three foot high flight path shared with one or two other planes is not as easy as it looks. When his engine quits, the pilot moves out to the edge of the center flying circle so his pitman can snag the plane. Missing your pitman is the easiest way to lose. 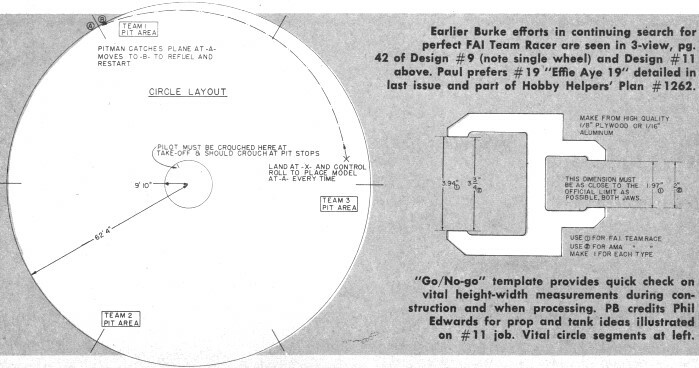 Once the pitman has the plane in hand he places it outside the circle segment mark, refuels, flips the prop and releases the model - assuming he has practiced this many times and never varies his routine. The pilot gets up from his crouched position and rejoins the other two flyers at the center of the circle. As soon as a plane flys 100 laps, the clocks on it are stopped. You are new to racing, so what times should you shoot for in the beginning? Six minutes is fairly good .for any non-National or International event. Should the contest be of National importance, 4:45. How can you ever do 6 minutes, you may ask, after your first 60-mph 15-lap flights. Take the engine out of the plane, if it's an Oliver, run it for an honest hour, on an 8x4 prop. This should free it up for more mph's and non-stop laps. Then put it back in the plane and PRACTICE. Windy weather, calm weather, rain and shine, you must know how both plane and engine will react. So read and heed, build our plane, learn your engine, study the rules, practice, and maybe you will end up among the leaders in FAI Team Racing. After all, who couldn't use a free trip to Europe? 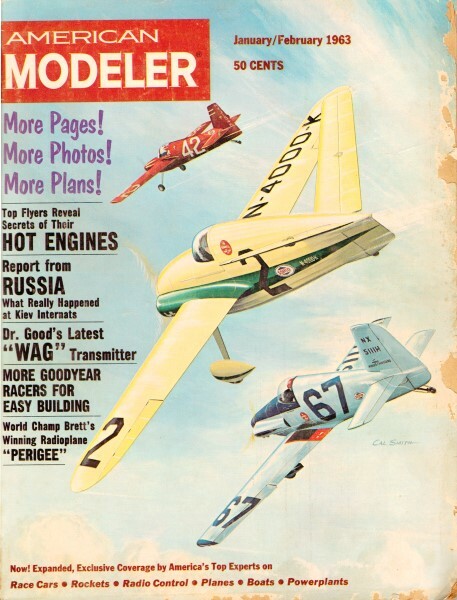 Earlier Burke efforts in continuing search for perfect FAI Team Racer are seen in 3-view, pg. 42 of Design #9 (note single wheel) and Design #11 above. Paul prefers #19 "Effie Aye 9" detailed in last issue and part of Hobby Helpers' Plan #1262. "Go/No-go" template provides quick check on vital height-width measurements during construction and when processing. PB credits Phil Edwards for prop and tank ideas illustrated on #11 job. Vital circle segments at left.